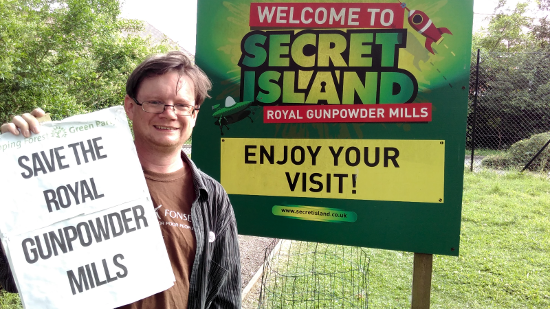 The Royal Gunpowder Mills continues to be one of the most regularly raised issues on our Green Party stalls in Sun Street. However, there’s not been much information about the future of the site since the reprieve at the Epping Forest District Council meeting on 6th June. This is what I know, mostly gathered from posts on the Streetlife website. The Foundation Trust met a couple of weeks ago, though there’s no information about what they discussed. The Operating Company has also met, but they are waiting on information from the Foundation Trust about their ideas for the future of the site. There have also been several suggestions about third parties who could be approached for funding and advice. While we’re waiting for further information I suggest that you join the Royal Gunpowder Mills Friends Association. The Gunpowder Mills has been nominated for the Kids In Museums Family Friendly Museums award. Nominations close tomorrow (Monday 11th July) at midday and it wouldn’t hurt to have as many nominations as possible! If you’ve visited as a family and would like to nominate the Gunpowder Mills there’s more information here: Family Friendly Museums Award.